"How could Americans, whose reputation for being independent and freedom-loving and respecting private property was worldwide put up with such tedious laws governing the building of their everyday environments and way of life?" The question has been examined before, though perhaps not as directly, and Hirt's citations include many prior books and studies that I have also discussed on the blog, including Robert Fishman's Bourgeois Utopias, Jonathan Levine's Zoned Out, Robert Fogelson's Bourgeois Nightmares, Kenneth Jackson's Crabgrass Frontier, Robert Fischel's papers on zoning and many others. Even Spiro Kostof and Besim Hakim (who has a new tome of his own focusing on Mediterranean urbanism) receive prominent mentions as Hirt surveys some 4,000 years of land-use regulation reaching back to Hammurabi. Apart from addressing the question above, another of Hirt's major contributions with the book is to provide a broad-scope land-use comparison between American land-use laws and the laws of several other developed countries, including France, Germany, Great Britain, Russia, Sweden, Japan and Canada. One of Hirt's conclusions, that the United States is the only developed country of those surveyed, apart from Canada, to widely employ single-family detached residential zones that bar all commercial and multifamily uses, was anticipated by her previous work. An equally important finding, in my opinion, is that the United States is the only country of those surveyed that does not conduct land use at the national or state level. Although the federal government and certain states have dabbled in land-use law with housing anti-discrimination policies and anti-snob zoning statutes, and a few (such as Oregon) have delved more deeply into regional planning, there is no national land-use law (despite the federal government owning 650 million acres of land) nor does any state prescribe zoning categories that municipalities must follow. Hirt also surveys a wide range of US zoning ordinances and finds little evidence that, despite the zoning reforms of the past 20 years, including the emergence of form-based codes, there has been any revolution in American zoning practice either in substance or procedure. Has the American zoning system secured the benefits promised by its proponents? 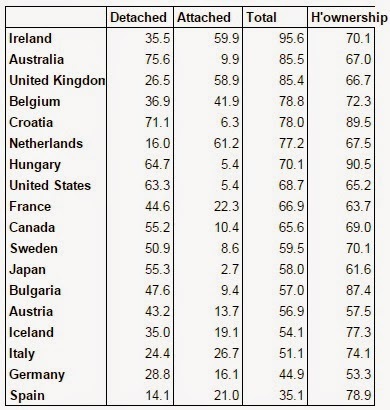 Hirt crunches the numbers and finds that the United States is distinct among Western nations neither in its rate of ownership nor its proportion of single-family homes (see below chart). Australia beats the US at its own game, having a higher levels of both detached and attached single-family homes with higher homeownership, despite even higher rates of urbanization. Hungary, with almost identical proportions of attached and detached single-family housing, has much higher homeownership. Interestingly, the chart shows no correlation whatsoever between proportion of single-family homes and the rate of ownership. The emergence of the condominium form of ownership, unanticipated by the zoning proponents of the 1920s, appears to have severed the link between detached homes and the homeownership rate. Source: Hirt (2014) and Japan Statistical Yearbook 2013. The American achievement appears to be the high proportion of detached single-family homes, which on this chart is behind only Australia, Croatia and Hungary, as well as the size of those homes. Hirt cites evidence from Fischel's work that, to me, shows that American focus on legal protections for the detached home form may have actually impeded growth in the homeownership rate by establishing excessively large minimum lot sizes. In Japan, by contrast, families are able to purchase slivers of urban land, which enables robust single-family homeownership levels in an intensely urbanized country. The same is true in Mexico, where homeownership, overwhelmingly of attached homes, is around 80%. It appears that, in the United States, despite rhetoric to the contrary, the exclusionary principle and the notion of ownership as investment are (or have become) the primary concerns of local planning and of national housing policy and finance rather than promoting homeownership. Those policies, though, are beyond the scope of Hirt's book and this post as well. I've been toying with a theory about SFR zoning, namely that it's basically an affordable housing program for the rich. Without SFR zoning, they wouldn't be able to use valuable urban land for their mansions and such, because the poor would be able to collectively outbid them, because while individually they may not have much money, collectively they can pay quite a lot of rent in an apartment building, which induces a developer to tear down the mansion and replace it with apartments. And to the extent that zoning isn't about keeping mansions affordable for millionaires, it's about forcibly upholding middle-class notions of propriety, like lawns and setbacks and making sure the house isn't used for anything so vulgar as making money. Yes, in fact, Edward Murray Bassett, the father of American zoning, said as much in his publications on the matter. Single-family large lot zoning was a means of subsidizing the presence of the wealthy within the boundaries of the city. Without it, it was presumed that they would depart to other jurisdictions (rather than, say, living in luxurious apartment buildings as they actually did in New York City).